Zhan Wang’s Ornamental Rock No. 71 in a metaphor for the fast changing face of China. 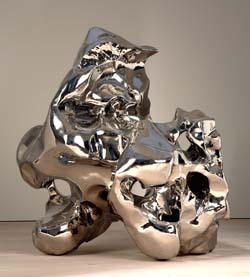 Inspired by the public sculpture often found outside Beijing’s new office development buildings, as well as the feng shui of traditional landscape gardening, Zhan created his sculpture by moulding a flat sheet of metal to a natural rock formation; once removed, this shiny skin is reformed to create a hollow and abstract representation of nature. In Chinese custom, rocks and water are the two most important five elements, and through the sculpture’s reflective surface Zhan combines both in a spiritual emblem, merging their associative connotations of stability, prosperity, and wealth. Celebrating 20 Years of Hanart T Z Gallery, Hong Kong Arts Centre, Hong Kong. 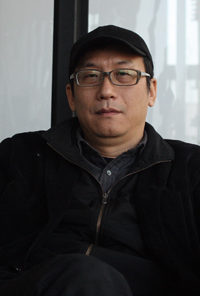 The First Guangzhou Triennial: Reinterpretation: A Decade of Experimental Chinese Art, Guangdong Museum of Art, Guangzhou, China.